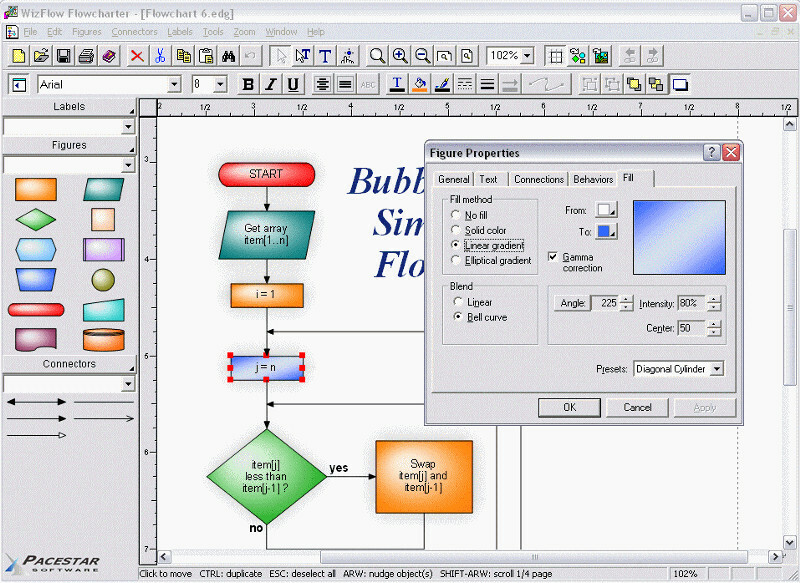 WizFlow Flowcharter 5.09.1851 is other software developed by Pacestar Software. A tool for creating flowcharts and similar diagrams. It allows you to work with a single object or a group of objects, drawing boxes or symbols of many shapes and connecting them with lines of various types. Extensive features such as full zoom, OLE connectivity for inserting charts in other documents, poster printing, graphics import and export, automatic routing, curves, flow symbols, and much more. This graphic apps software is shareware, which means you can download and use WizFlow Flowcharter 5.09.1851 for free during the trial period (usually for 30 days). At the expiration of the period you will have to buy the other product for $49.95. WizFlow Flowcharter 5.09.1851 is available at regnow and Pacestar Software website. WizFlow Flowcharter 5.09.1851 supports different languages (including English). It works with Windows 98/XP/Vista. Latest WizFlow Flowcharter 5.09.1851 does not contain any spyware and/or advertise modules, allowing installing it with no worries concerning valuable information loss. We has completely tested other software WizFlow Flowcharter 5.09.1851 many times, written and published the interesting article and uploaded installation file (4986K) to our fast server. Downloading WizFlow Flowcharter 5.09.1851 will take minute if you use fast ADSL connection.